Palo Alto, Santa Clara, San Ramon, Fremont, San Mateo Camps are OPEN for Enrollment. No content is repeated. For e.g. "I Love India I" is different from "I Love India II" etc. You will be able to choose multiple camps in One screen for each child! Pay for all children by any major credit card! That's all! Click here for more registration guidance if needed! My daughter really loved this camp. She is more interested in learning Hindi. She is also proud to be from India. She is now interested in learning more about India. My daughter's first experience in an Indian school was fun. She learned a lot but mostly became familiar with the sound of Hindi which is a great catalyst for us to continue her practice at home. A wonderful exposure to Indian culture in a fun and engaging way. Very well organized and the teachers are amazing with the kids. They made sure all the kids were engaged and learning. My kids were very happy and already excited to come back next year. This is our first week in Camp Jano India. We are very happy with this camp. My son enjoyed his stay a lot. He was very happy to learn the Indian National Anthem, write his name in Hindi, perform in a Hindi play and make new friends. We highly recommend this camp to everyone and hope in the coming years we would have something similar in the Fremont area as well. Great Camp. My daughter has been very excited for months now. The camp exceeded her expectations. She seems to have had fun and learned a few things about India along the way. At first my son was not happy at having to go to Hindi Camp during his vacation! But at the end of the 1st day I could tell he had enjoyed himself (even though he had had a bicycle accident the previous day & his injuries were bothering him) By the end of the week he was wanting to enroll for an additional week! He learnt a lot during the camp. I had tried to teach him Hindi alphabets in the past but eventually gave up as he wasn't interested. This week appears to have ignited some interest in learning Hindi (perhaps the company of other kids like him helped and the wonderful teachers!) in Aadi. I look forward to more weeks of learning & fun for him this summer in Jano India camp. Great camp. Kids learnt a lot about India especially Hindi language. Kids really remember what they learnt here. Kids love this camp. Very impressed with all that the kids learnt in one week. My kids went from no Hindi to singing Jana Gana Mana! Am going to sign up for this camp every summer. Once again Jano India Camp did it. Very personal touch and wonderful coaching. We are a big fan. Looking forward to the next week now. 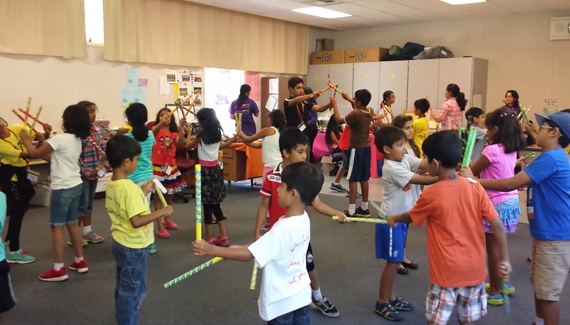 Excellent camp; Good experiment to introduce kids to Indian culture, National language & customs/history. My child (son) greatly enjoyed the camp. He made friends learned Hindi and Indian culture. He can't wait to come back next week! Thank you to all the great and dedicated teachers. Good job by the camp's teachers and the administration. Kids love to come to Jano India. Good learnings (culture, language) about India. Great effort by teachers. Excellent! Kids learnt a lot in a week. Camp surpassed my expectation. I'll surely send my kid again and refer to other parents. Thank you!! The performance was a great idea. Good shows – Amazing. Kids did amazing job. Teachers have taught so much in 5 days. Thanks for the great experience that my daughter had at Jano India camp. The teachers were very cooperative with our erratic schedule this week. Ira loved making new friends and experiencing India in a true sense. Thanks again. This is a wonderful camp which connects children with our great culture and would really recommend this camp. My kids don't speak a single word of Hindi at home. It was amazing to watch them sing and perform in Hindi after attending one week of this camp. The teachers have done a great job persuading the kids to be part of the camp and its theme. This is our first time enrolling our kids in the Jano India Camp. The first day before dropping the kids were telling they were not very enthusiastic to go, but at the end of the first day when I picked them up, they said they loved the camp. I am really happy at the speed they have learnt the Indian language, info about cities, different food, and performing an amazing show. I will definitely recommend the camp to my other friends. I had heard very good things about camp Jano India and now I can say "Yes, It is indeed a very good camp." My 8 year old learn about the four major cities and could sing Tvamey Mata and Saare Jahaan se Achcha. The feeling is amazing to describe the joy of seeing her do all this. Thank you so much Jano India! This week of Incredible India was really great. Our daughter really enjoyed learning Hindi & about India in a fun manner. She learned about making foods from different parts of India. She also learned four metro cities. The girls had a wonder time and have been trying to converse Hindi when they come back home. Great job teachers. Kids have learned lot of Hindi and India. She was excited to come here and enjoyed every bit of it. Thanks and keep it up.J ano India was an excellent foundation for my daughter. She learned an incredible amount in just one short week – almost as good as visiting India itself! I've been suitably impressed by their ability to handle mixed age groups and mixed-level groups and keep the curriculum fresh and engaging. My daughter came home from her first class knowing how to write her name in Hindi and the Hindi club at her school has become somewhat of a poster-child for other language after-school programs. I showed her workbooks to my mom and cousin from Canada and they were very impressed – and these are people who teach extra-curricular Hindi programs in Ottawa/Toronto respectively. My husband and I would be very strong advocates/supporters of bringing this team in. My daughter enjoyed learning Hindi here. Amazing Camp. Very well organized and lot of relevant info taught in camp. My daughter enjoyed a lot. One more wonderful week of learning with ton of enjoyment. Thank you team Jano India! My daughter had great time during this week. She gained quite a bit of knowledge about India Gems and Stamps. Rutvi enjoyed this week and would love to come back soon! Thank you Jano India! This was a wonderful week for kids. My kids learnt a lot about writing letters in Hindi and about stamps. Excellent program. My son is enjoying the camp – He even asked me to enroll him for an additional week! In addition he is making more effort to speak in Hindi with me at home. Excellent teachers and great camp. My son learnt a lot about Holi and Janmashtami. He could narrate the full story of Holika well. The holi playing was a lot of fun too. Highly recommend Jano India Camp. The best way to learn about India, culture and history! Sanchet loves every bit of the camp. Please start something in Fremont area. He would love to come back. Camp Jano India has been an amazing experience for my 5 ½ year old. He has learnt how to write his name in Hindi, learnt his alphabets. He had a great time making new friends and celebrating Holi with them. He definitely is going to continue learning Hindi at Jano Hindi and coming back to Camp Jano India in 2015. Thank you to all the wonderful teachers. My daughter attended Jano India for 2 weeks and she had so much fun. I was surprised to hear from her the amount of Hindi that she learnt in 2 weeks. Teachers were very nice and accommodating and were considerate towards every minute detail. I would be sending to more of the camps in coming weeks. My kids enjoyed playing holi. My son who did not know any Hindi prior to this camp was able to participate in a play. He wants to learn Hindi now. Great Camp. Kids enjoyed the Holi celebration and Hindi Mythology stories. Great to see everyone perform Hindi skit on stage. Nicely done! For our non-Hindi speaking son. It was a great way to develop interest in Indian culture and language. The play at the end was adorable and slickly done. Thank you teachers for all your hard work! The camp keeps children engaged throughout with a wide variety of activities. My daughter's Hindi vocabulary went up from 0 to about 30 words in a week! Awesome job Jano India !! Fantastic Camp! Kids learnt something new every day. They brought back quite a few things. The amount of things they learnt was simply amazing.